At the rear of St Werburgh’s Church is a small graveyard with about 200 headstones. These are in poor condition which will make the inscriptions very difficult to transcribe. The graveyard itself is well tended by the current sexton. The stones have been placed against the east and south walls and some laid flat around the perimeter to form a pathway. This seems to have been done sometime before 1961 judging by a photograph held by the National Library of Ireland. The burial books listed on www.irishgenealogy.ie contain over five thousand names. The earliest recorded burial in these, is 1703. The early burial books are quite detailed. Causes of death such as fever, small pox, consumption and child bed (which we take to mean childbirth) are listed. There are numerous deaths of infants giving cause of death as just 'infant', which brings home the fragility of life in these times. These registers also contain address details listing names like Cole's Lane, Gun Alley (a reference to the watch tower that was nearby) and Hoey’s Court (just at the back of the church which later became known as Castle steps). Engine Alley is also mentioned frequently, an alley quite close to the church named as Indian alley on some early maps. Supposedly Engine is a corruption of Indian (think Cowboys and Injuns) as the Alley was a market lane selling cotton and other fabrics from India. The burial register closes in 1898 but the graveyard did not officially close until 1920. There are 27 vaults beneath the church reached by steps near the chancel. These vaults were to be reserved for the rectors of the Church but this is where Lord Edward Fitzgerald’s body is interred. (A History of the City of Dublin by John Gilbert). The story goes that his body was brought to the church in darkness with only one mourner, his aunt, Lady Louisa Connolly of Castletown House. Other burials include the Attorney General for Ireland Nicholas Sutton in 1478, Sir James Ware the historian in 1666 and John Edwin the actor in 1805. Major Sirr who was responsible for the arrest of Lord Edward Fitzgerald is also buried here. 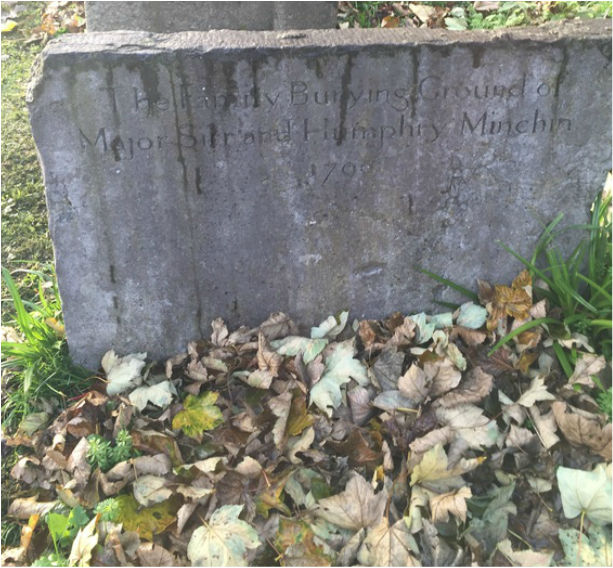 His headstone, although broken is one that is quite legible (photo above) and reads 'The family burying ground of Major Sirr/and Humphry Minchin 1799'. Cut stone fragments from Christ Church were sorted, cleaned and catalogued, then moved to the crypt of St Werburgh Church in 2002 (Dublin City Council Archaeology report - Moss 2002). 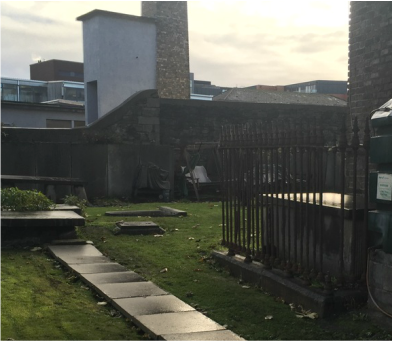 In 1785 part of the footpath of Darby Square (just off St Werburgh’s Street) gave way revealing “a cavern forty feet deep revealing a great quantity of coffins and bones – ‘probably the debris of the old cemetery of St. Martin’s church’. (Gilbert). Our thanks to the Ven. David Pierpoint, Archdeacon of Dublin.